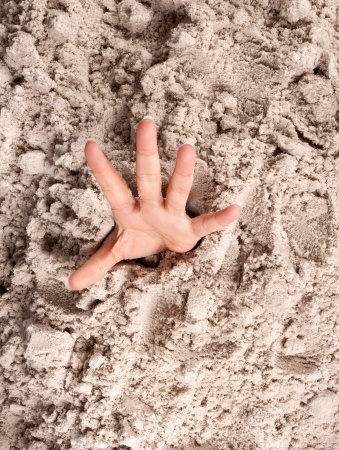 The impact of discounting on brand equity – and mind the quicksand. Price discounting’s effect on brand equity has kept a heated debate boiling: advertisers vs. agencies, ad agencies vs. promotion agencies vs. digital agencies, sales managers vs. marketing managers, manufacturers vs. retailers. It’s a 10-parent child custody battle. The brand sits quietly in the corner of the room while its guardians all argue convincingly that they know what’s best for it. Can your brand escape the quicksand? A brand is a promise, as perceived by prospective purchasers. Brand equity is real equity, the balance-sheet value of that identity. Its strength is built on its ability to remain unaffected by temporary fluctuations in any of the comprising factors. Consumers have a collective image of a brand, created by the deployment of its brand assets: name, tradition, packaging, advertising, promotion posture, pricing, trade acceptance, sales force discipline, customer satisfaction, repurchase patterns, etc. Clearly some brand assets are more important to product marketers than to service marketers, and vice versa. Some competitive environments put more of a premium on certain assets as well. The most powerful value contribution of a strong brand is the ability to demand and defend higher prices than competitors. Since powerful brands produce higher margins, discounting can be a sign of weakness: brand demotions. The ultimate decision-maker is the buyer. You cannot dictate or wish away whether discounting has an effect on brand image. Don’t fall into the trap where you confuse the message sent with the message received. Some marketers believe “positioning” is inherent in their advertising … but it never is. Your position is found between the ears of the audience. Let’s repeat that another way because it’s central: you cannot dictate what your prospects perceive. They’ve got the steering wheel. Your brand image is its value versus competition. Quality is a belief, often difficult to articulate, in the collective mind of users and prospects. For example, in every distilled spirits focus group conducted since the dawn of time, the high-quality brand (usually the category leader) is described as smooth, lower quality entries as harsh. A blind taste panel shows no detectable differences. Quality is a judgment made within the context of the consumer’s experiences and predispositions. The range of commitment ranges from unshakable to firm to flimsy. Price, on the other hand, is rock hard. It is not an impression built up over time. It is a number printed right there for the world to see. While consumers may not have prices committed to memory, they usually have a good feel for a product‘s price relative to competitive products. So for product managers, prices are temptingly easy to change, especially compared to perceptions of quality or product formulations. Virtually no lead times. No costs for retooling or new packaging. And what the hell, it’s only going to be for a short time so we can make our numbers for the quarter. No one will notice. If you work for General Foods or Frito-Lay or similar let’s-cross-train-every-manager enterprises, you might feel your tenure with a brand is 18 months max, so why worry about long-term issues like brand equity? Wall Street only demands a better quarter, regardless of any long-term brand equity damage. The perception of quality may not be fixed as firmly in the mind of the consumer as the producer might wishfully think. Discounting may have zero brand benefit for new products which have not established their quality reference point within the competitive field. Products creating a category, because the quality half of the value equation has not been established, suffer a similar penalty. In this situation, the discount serves only as a trade lever or bonus. The question “What’s the deal?” is expected as a way of motivating the trade. Discounting will have an adverse effect on value for an established brand. Quality and price do not exist as isolated concepts in consumers’ minds. They are tangled together. Research has shown deep discounts cause the consumer to believe that something is wrong. Frequent discounting serves to lower the value of the brand because of an almost subconscious reaction that quality also has been lowered. (“Welcome to Kmart. Martha Stewart over there.”) Or, in a “value rebound,” consumers begin to perceive the everyday price as a reason to postpone the purchase. The brand is then bought only on deal. Whole categories have been poisoned that way. Nobody expects to pay “full price” for washers, or tires, or mattresses. Ever. Perhaps the greatest danger in frequent discounting is to loyal users. Discounts are offered in an effort to get new users or increased volume. Some new users are induced to trial. Loyal users, however, who would have bought the product at its normal price because they believe in the quality/price relationship, now purchase to the brand’s detriment, thanks to lower margins and their removal from the marketplace. Imagine a substantial discount or BOGO for products such as steak sauce, acrylic floor wax, or pickle spears, which have a use-up rate measured in months, not days. Does it make sense to take out of the marketplace for over a year a user who would have bought the product anyway? Consider the form the discount takes. Coupons are suffering from declining redemption rates. This is due in part to the increasing avalanche of coupons being distributed. In the future, marketers must look at coupons as only a weapon in a broader tactical effort, never as a strategy. Strategy implies long-term vision and planning, a concrete goal to be achieved over time. Coupons should be used as a weapon only if delivered to the right consumer segment within a context that enhances the brand’s quality perception. One should also question coupons in new product introductions. Given the Value = Quality/Price equation, the question is valid. Granted a coupon can induce trial, but within the context of V=Q/P, the P is artificial and the Q unestablished. Ever wonder why so many new products succeed at launch but perform poorly in the post-test market? The heavily-couponed or widely-sampled product tested is not perceived as the same product as the one ultimately sold. The usual excuse, that getting consumers to “try” so they’ll discover the quality and be willing to pay full price in the future, asks consumers to do work for which they have neither time nor inclination. Rebates appeared at one time to be the answer. By building in enormous breakage factors, extremely high face values could be offered … sometimes so high that retailers could advertise products (famously, hair dryers) as FREE. Here, too, there was a consumer rebound, rejecting the increasingly complicated steps needed to qualify for a rebate. Consumers aren’t stupid, and harder to fool than ever. The rebate fad faded. If one wants to see just how ineffectual and cannibalistic rebates became, just ask General Motors. Or for contrast, note how Honda established a V=Q/P relationship combining high-quality elements and very economical prices. When the quality perception became entrenched, prices were raised without adversely affecting value. Finally, discounts at retail. Retailers want to sell more of anything than the merchant down the block. Brand building is not as high on the priority list vs. getting acceptable margins and high turns, regardless of the impact on brand image or long-term value enhancement. Through discounts, allowances and fees they want to be able to offer the same goods as their competitors at more competitive prices. How then can marketers reconcile their goals for the brand with those of the retailer? The goal, of course, should be to establish a high quality/price relationship with the consumer. And then, if and when discounting becomes necessary as a trade lever, boost the quality portion of the equation so that the Value = Quality/Price equation remains relatively unchanged. Retailers should be required to perform some image enhancing (like end caps or POP display) while offering the product at the price they claim will make it move. Note: inclusion in an ad circular is not image-enhancing! A savvy marketer offers the tools for the retailer to help boost the quality perception. Few use them. Fortunately, there are some retailers who understand the concept of brand equity not only for the products they offer but for their store identity. Contrast this with retailers who seem confused and distressed by WalMart’s relentless growth. WalMart built tremendous equity in their name. And their credibility helps the brands in the store … after all, in the consumer’s mind, WalMart is responsible for the low price of light bulbs, so (producer) product quality is not compromised. The expectation of low price, which is an important component of WalMart’s brand personality, protects branded goods from value rebound. A few final points. First, avoid getting into the cycle of frequent deep discounts. Second, if you are in it, get out. A deal can always be beaten by a competitor. An image is quite a different thing altogether. Strong brands can benefit from a strategic discount program, within the context of a brand equity building plan. Brands developing equity realize no benefit over the long term from frequent fire sales … and may even suffer promotion-demotion. Finally, with discounting a fact of life, make a concerted effort to assure the most effective deployment of all brand assets, unified by a central strategic vision, in order to build the quality side of the equation. Questions? Call Bob Killian on his cell 312.399.2894 to talk about your brand, and how to distance yourself from competitors.